On Friday, March 25, Miss Murray’s 4th grade class hosted a “wax museum” at Killington Elementary School. 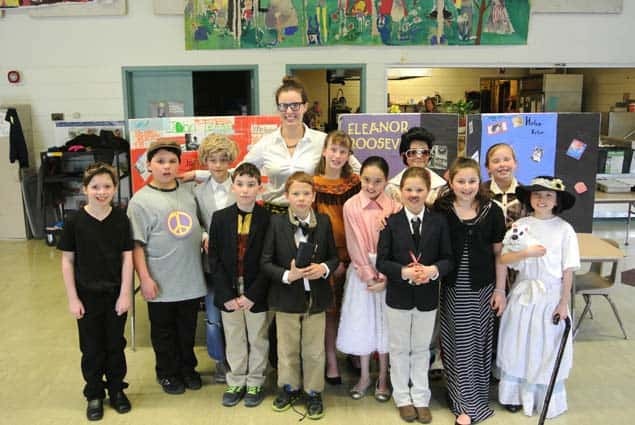 KILLINGTON — Miss Murray’s 4th grade class at Killington Elementary School hosted a “wax museum” on Friday, March 25. Each student wrote a biography on a famous historical person, and dressed up as their subject for the event, standing in front of a tri-fold board with facts and photos. The fourth graders presented their subject to the rest of the students at Killington Elementary, as well as parents and grandparents, who came through the cafeteria to see the museum, Friday. As participants came by, the fourth graders recited a speech they had prepared about their historical person. Clara Shortle was Elizabeth Blackwell, the first female doctor. Emma Blodron was Pocahontas, Charlie Rice was Charles Darwin, Brexton Eckler was Albert Einstein, Brian Hayes was John Lennon, Joseph Goes was Johnny Cash, Quinn Stickney was Abigail Adams, Maxwell Abrams was Nelson Mandela, Paige Fieldhouse was Helen Keller, Sophia Nisimblat was Martin Luther King, Jr., Lexi Fuster was Eleanor Roosevelt, Jacob Roth was Elvis Presley, and Chloe Masillo was Sea Biscuit.